A PCB fabrication drawing specifies how the PCB is to be manufactured. 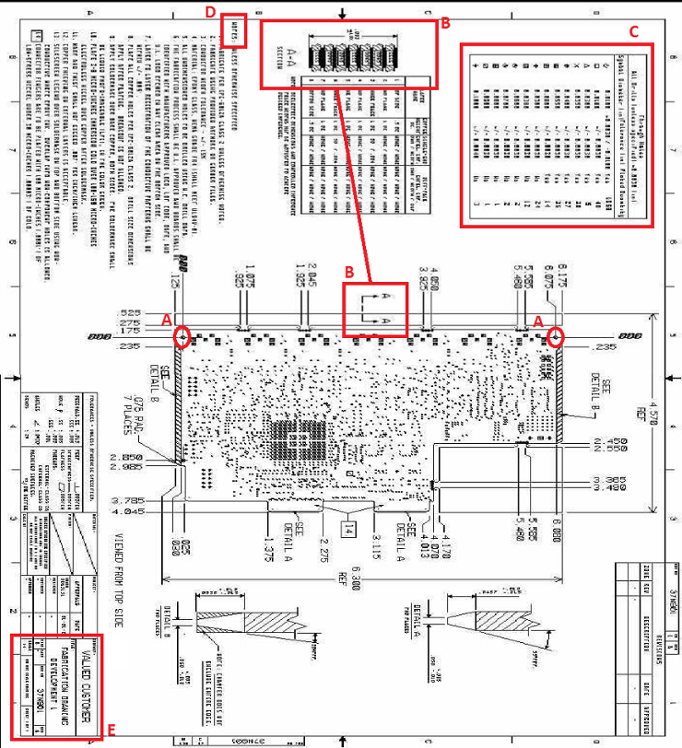 The success of any PCB manufacturing project depends on the detailed notes that are included in the fabrication drawing. Typically the design files (typically Gerber or ODB++) contain the most basic structure and outline of the board design, whereas the fabrication drawing tells the manufacturer the specific details about a board that make it unique. Without a fabrication drawing, engineers are subject to the default specifications of their manufacturer. When a fabrication drawing is included, it is regarded as the blue print of the project and makes clear to the manufacturer exactly what quality and specification requirements are needed to create the desired PCB. A fabrication drawing allows engineers to customize beyond the simple dimensions and layout of their board designs. You can check out the PCB Layout Service of PCBWay.com . It is one of the best places to buy cheap and affordable PCBs. A poor fab drawing has the possibility of slowing down your fabrication process, and even canceling the board outright. The main items included on a fabrication drawing are specifications and tolerances. Specifications include any information that is not readily available from the Gerber data. Tolerances are any requirements that could differ from the manufacturer’s standard tolerances or what is established as the minimum quality tolerances. Most often, the typical tolerances are standard practice. So, if there are requirements that differ from the standard tolerances, it’s important to make sure that it is noted during the quoting process (tighter tolerances may increase costs, as the manufacturer considers risk associated with lower yields). Many PCB design software tools will allow the creation of a fabrication drawing. The board illustration shows the actual board outline with all cutouts, corners, and radii. Usually, only the top side of the board is shown. Board dimensions are referenced from the 0-0 point as shown in Fig.1(A). The 0-0 point on the fabrication drawing must match the 0-0 point on the NC Drill data, which were generated in the Final Extract process. All drilled holes are indicated with symbols linking them to the drill chart. Under a column labeled, “Symbol,” the drill chart lists each drill symbol used in the board illustration as shown in fig.1 (B). Other columns give further information regarding each hole type. The hole size is the actual finished hole size after plating. The quantity is the actual number of holes drilled to this specification. Items identified in this view are the overall board thickness, the layer numbers of the board, description of the layer such as component side, VCC plane, etc., dielectric thicknesses, and impedance information. This is shown in Fig.1 (C). If a Section A-A diagram is shown, as is usually the case, the board illustration must contain an indication of the point from where this view is seen. The last typical section on the fabrication drawing contains the fabrication notes as shown in fig.1 (D). Even in the highly standardized case, there is always some item to modify for the particular board on which you are working such as finish type, gold fingers, or miscellaneous silkscreen aspects. The fabrication drawing title block should also be filled out with the name of the customer, the name of the board, any drawing or fabrication numbers specified by the customer, and creation date. This is shown in fig.1 (E). Many PCB design software tools allow the creation of a fabrication drawing. You can start with just the board outline and use text to fill in the details outside of the outline. When the fabrication drawing is complete, simply include the drawing as part of the data package provided to the PCB manufacturer. This helps to ensure that the information does not get lost or forgotten as it travels through the ordering process. One important thing is that, occasionally, a purchase order will include specific details and requirements for the job. If a purchase order has details that conflict with the fabrication drawing, the purchase order details will be followed and will override the fabrication drawing. In case the PCB design software does not include the functionality to create a fabrication drawing, there are other alternatives that can work. Use a basic graphic design or presentation software tool, as simple as Microsoft PowerPoint, to create the drawing and save it as a PDF file. Or, even a README text file can be helpful to include the relevant details. While fabrication drawings are not required by manufacturers to fabricate a PCB, they’re certainly very useful and will help ensure that the PCB you receive meets all of your required specifications. If you need PCB Assembly Services, you may check out PCBWay.com, as they have affordable options even for low volume buyers.